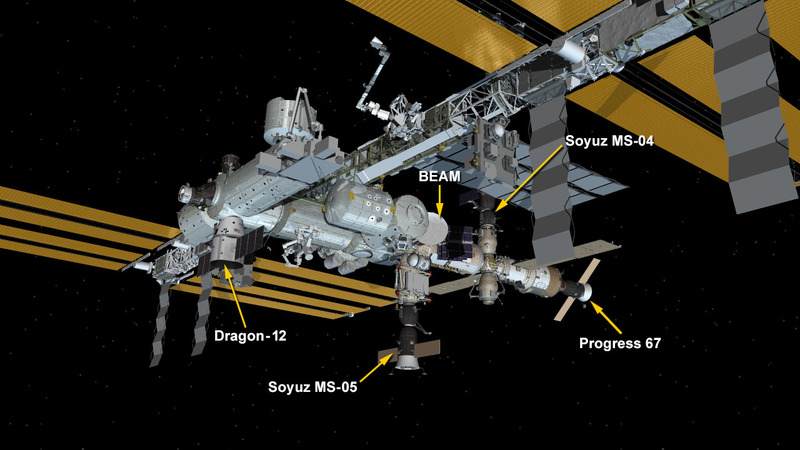 Four spaceships are parked at the space station including the SpaceX Dragon cargo craft, the Progress 67 resupply ship and two Soyuz crew ships. CRS-12 is scheduled to deliver more than 6,400 pounds of supplies and payloads to the station, including a sweet treat for the astronauts: ice cream. The small cups of chocolate, vanilla and birthday cake-flavored ice cream are arriving in freezers that will be reloaded with research samples for return to Earth when the Dragon spacecraft departs the station mid-September. For more information about the SpaceX CRS-12 mission, visit www.nasa.gov/spacex. Join the conversation on Twitter by following @Space_Station.